Collectors have until 11:59 p.m. ET Sunday, Dec. 31, to order United States Mint "Last Chance" products. There are more than 150 products going off-sale forever, including Standing Liberty and Walking Liberty Centennial Gold Coins, Presidential and First Spouse issues, prior-year quarters and sets, 2016-dated Native American dollars, and 2016-dated Kennedy half-dollars. CoinNews wrote earlier about last chance Presidential $1 Coin products. The U.S. Mint has reminded customers about their ending sales for some time. 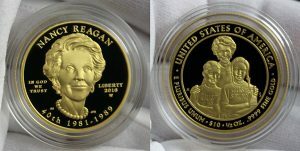 The series ran 10 years, ending in 2016, with the last coins honoring Ronald and Nancy Reagan. The U.S. Mint has a landing page for its last chance products right here. The 2017 commemorative coin sales already ended yesterday December 28, 2017. Furthermore the 2017-W Boys Town Uncirculated $5 Gold Coins sold out earlier than expected by December 7, 2017. They are the lowest mintage coins at only 2,994. On ebay Item #112701160445 for one such raw coin recently sold for $899.95 on December 22, 2017 @ 05:32 AM PST. Its U.S. Mint issue price was $412.95. $899.95/$412.95 means a 117.9% Gain.